I love making my own caramel sauce and my method helps to avoid burning it up as you try to get it to the perfect place. 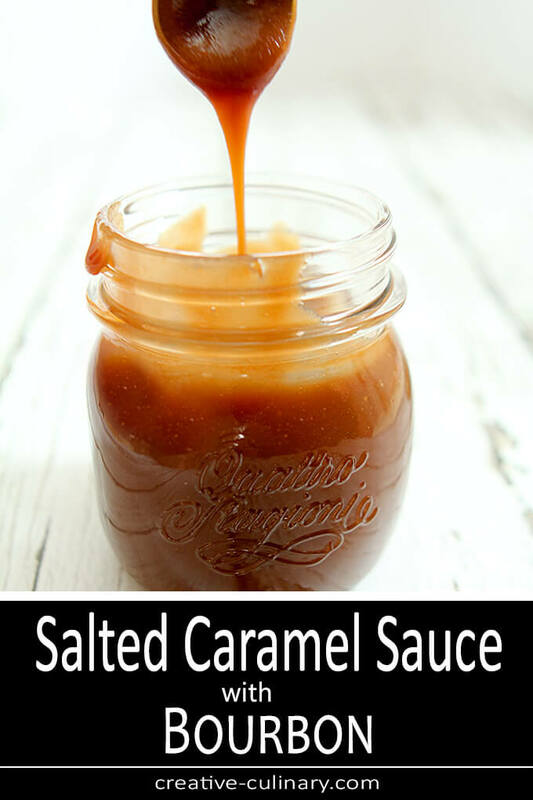 If you love caramel with a touch of salt, you will LOVE that The Best Salted Caramel Sauce has Bourbon! All too often I include a recipe for a topping with the food that I made the topping for and I realize that some really good accompaniments get buried in a post about something else. 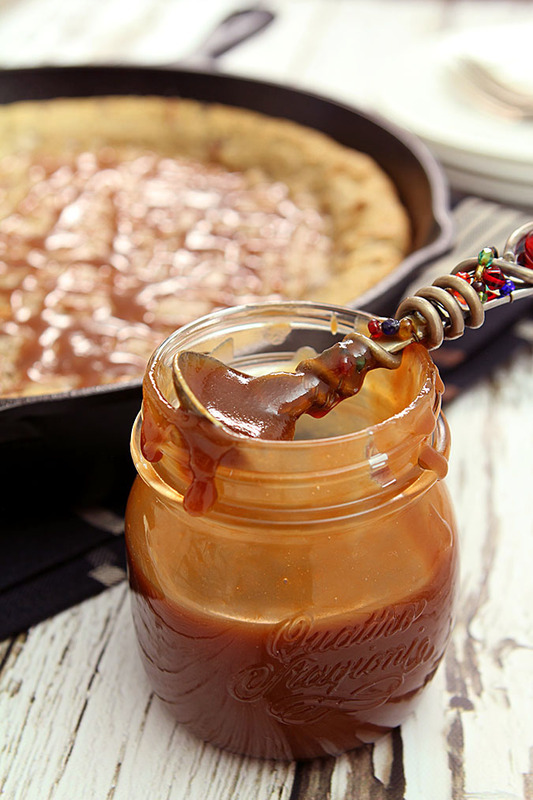 I almost did it again when I made a caramel sauce for a Skillet Chocolate Chip Cookie this past weekend but luckily caught myself in time and just had to share this caramel sauce all by itself. What makes it so special? Would you be completely surprised if I said that The Best Caramel Sauce Has Bourbon? I thought not and it really is the best. I made this to drizzle over a cookie I made. A HUGE cookie. Have you ever made a cookie in a skillet? Well I did and I’ll be posting it in the next day or so. SO yummy…a huge cookie filled with a combination of milk and dark chocolate along with a fair amount of pecans. What I love about it is how gooey the center is in contrast to the crispier edges…a little of both of the best of a great cookie right? Or Cookie Pie. Or…well you get my drift right? That the combination wasn’t quite enough is crazy but I just had this urge to add some bourbon caramel sauce and that urge would not be denied. It was a good one; hope you think so too! Like everything else I make with a bit of booze; it’s got a light touch. I’m really not interested in a strong alcohol taste; I simply know how a smidgen of bourbon can make sweets taste even better with that little shot of perfection. This is my standard caramel sauce with a hint of bourbon. I’ll do the same thing and add any number of flavors depending on my mood. Rum is good as is Bailey’s Irish Cream and I love a version made using orange liqueur. I’ve been making my own caramel sauce for a long time and while I’ve had success with the method of just melting the sugar without adding the water or syrup I simply find this method a bit safer and have had less issues with either burning or crystallization. Trust me I’ve looked away a few too many times and have burned a LOT of caramel. Let’s call this method one with a bit of an insurance policy. You can still burn it if you’re not paying attention but the addition of the water makes for a bit gentler process and I’ve never had a mishap since I started using this method. Try it, you’ll see…so easy you’ll never buy a jar of the mostly fake stuff again! 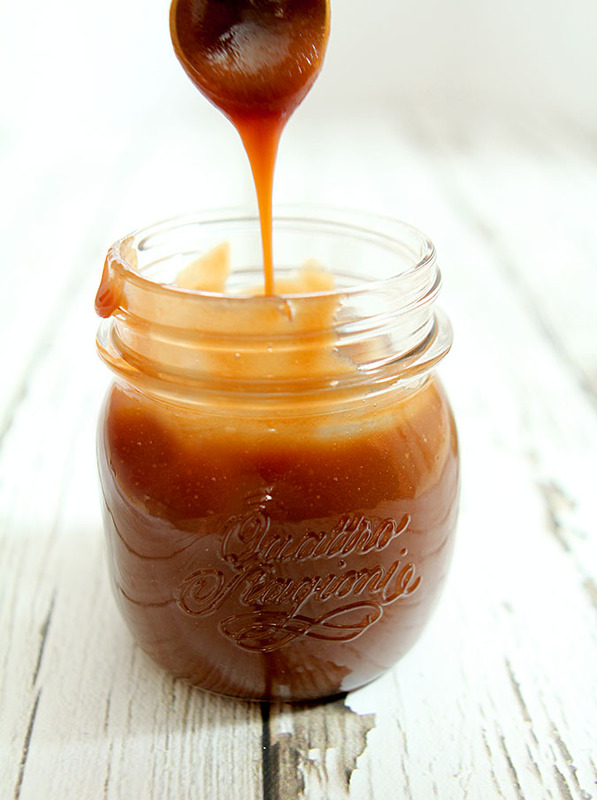 The Best Caramel Sauce Has Bourbon! Combine the sugar, water, and corn syrup in a large saucepan and bring to boil over high heat. Whisk to insure sugar has dissolved. Once the sugar has melted, boil the mixture for approximately 8-12 minutes. Watch CAREFULLY. The mixture can go from perfect to burnt in seconds and you will have to start over. Gently swirl the mixture in the pan to mix it if necessary but be cautious to not allow too much sugar on the sides of the pan. As soon as the sauce starts to smoke and has turned the color of a new penny, reduce the heat to low and add the heavy cream in a slow steady stream. You'll see the reason for a large pan now as the mixture will bubble furiously up the sides of the pan. Add the vanilla, bourbon and salt and whisk the sauce until it's smooth; being careful not to let any bubble up on you; this stuff is hot and will burn! Once it's whisked until completely smooth; let it boil for another minute and then take it off the stove to cool slightly. I like to store mine in Mason jars; they are the perfect heat safe glass and have lids to boot. Pour the sauce into a jar and let it cool completely. Cover the jar with a lid and store the sauce in the refrigerator and it will be good for approximately 2 months. It will never last that long! To warm simply remove the lid and either put in a saucepan with hot water for about 5 minutes or warm up in the microwave; medium heat for 1-2 minutes depending on the power of your microwave. Nice article, very use full. I made this earlier today and it was SUPERB. Just incredible – the best caramel I’ve ever tried. It was perfect with the caramel almond ice cream torte! Thanks for sharing. Love hearing you loved it too…made my day; thanks Rach! I bet this is the best caramel sauce! Great idea to add the bourbon and I’m looking forward to seeing that skillet cookie that was topped with it. Bourbon makes most things better. 🙂 Love the idea of using it in caramel sauce — definitely a must-try. Thanks!